Kamal and his team in Nepal have conducted more snake conservation workshops and awareness programs in these communities. The communities were selected based on discussions held at the district level workshop earlier this year. The programs have focused on diversity, distribution and habitats of snakes, identification of venomous and non-venomous snakes, procedures for avoiding snakebites, appropriate first aid methods, symptoms of venomous bites by cobra, krait and vipers, treatment after bites, misconception on snakes and snakebites and snake conservation. Local people were made aware of the importance of snake conservation by mobilization from local leaders, community forest user groups, local conservationists, students and teachers, health personnel, media personnel, CBO members through workshops, training’s and discussions. Awareness programs have helped in changing people’s perceptions towards snakes. At the end of each awareness program, the participants were motivated to share their knowledge to at least one of their three neighbors, who had missed the opportunity to participate in the programs. Many community members at various study sites have gained knowledge on the conservation of snakes through the conservation awareness programs, educational material (photographs, posters, brochures, pamphlets, books, banners etc.) and through different media platforms (local and national newspapers, F.M. radio and television). The success of the awareness programs is attributed to the collaboration between Nepal Toxinology Association and organisation such as The Biodiversity Conservancy Nepal, Kaligandaki Health Foundation, Shankarnagar Banbihar and Research Center, and Green Youth Lumbini. With the help of various leaders from the communities, Kamal and his team were able to establish four Snake Information Centers in each of the communities where the workshops and programs were held. The centers will now be able to provide all information on snakes. Some copies of the educational materials printed for education and awareness camps were handed over to these centers as references and materials supported from other sources on conservation will also be kept in these centers soon. The following organizations/places have agreed to serve as a Snake Information Centre. The Nepal Toxinology Association and Biodiversity Conservancy Nepal jointly organized a snake handling course and snakebite first-aid training for the community members. Kamal and his team also trained them for appropriate first-aid methods after snakebite. The participants were selected from the different communities on the basis of their interest and capabilities to handle snakes. At the end of the training session, they distributed a non-collapsible snake tong to the participants that represented their communities. Kamal and his team handed over eight 5 feet sized hoarding board to the Shankarnagar Ban Bihar and Research Centre in the presence of President Baburam Aryal and Secretary Khimlal Pandey. They placed the board at the entrance of the Zoological Garden so that the visitors can easily see and read the information on the board. The gardens welcome approximately 400-500 visitors everyday. The gardens also received educational material (brochures, both in English and Nepali, Posters, Souvenir, Health Bulletin), laminated posters and two snake tongs to rescue and relocate snakes to safety. 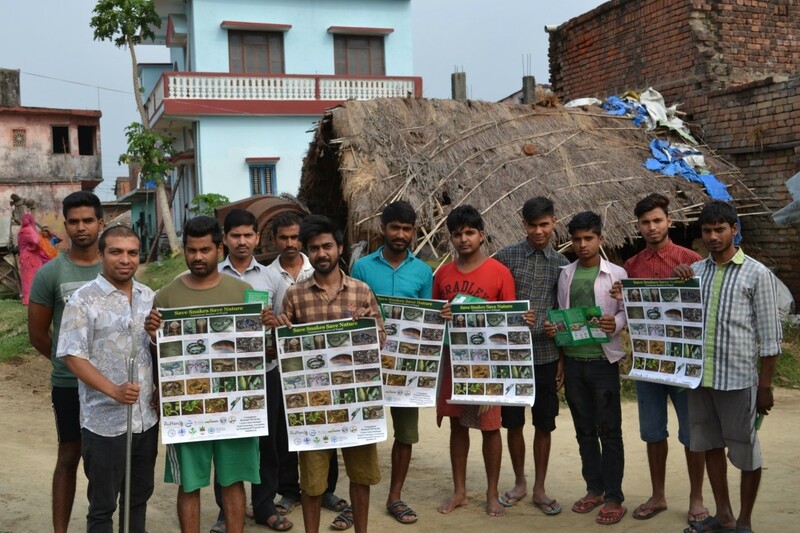 Kamal and his team also distributed snake identification boards to Arjun Kurmi, Prabhu Prajapati and Jagadish Tharu who are the representatives of Green Youth Lumbini, Bhagwanpur, Lumbini Sanskritik Municipality; Lakshminagar, Dhakdhai, Rohini Gaupalika and Sagrahawa, Makrahar, Tilottama Municipality respectively. They have placed the boards in suitable locations where community members can easily see and read the information. Kamal and his team are planning to establish a snake recue center at Shankarnagar Banbihar and Research Center which have already been proposed to related departments.